Do you feel lethargic or suffer from body pain the day long? Is your smile being taken away by some or the other type of health ailment? Do you feel stressed out and lesser focused at your tasks? If your answer to any or all of these questions is a yes!, then this post is definitely for you. 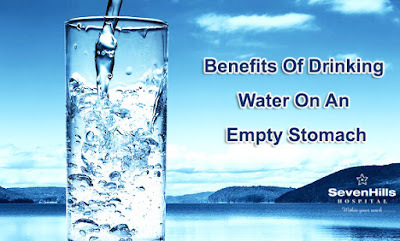 In one of our previous posts, we told you how drinking water can treat dehydration. With this piece now, we will tell you how drinking water on an empty stomach can help you for the better – making you feel energetic and healthy! Every morning, make it a point to drink 1-2 glasses of water on an empty stomach, immediately after waking up, and avoid eating or drinking anything else for the next 45 minutes. Doing so on a daily basis can keep you at bay from the following health ailments. One of the easiest ways to regulate high blood pressure is to drink enough water as dehydration can add pressure to your capillaries and arteries, thus leading to heart diseases and stroke. Water also reduces the impact of sugar in a diabetic diet and protects you from the many sleep problems linked to diabetes. Water eliminates waste products and harmful materials from your joints and allows the healthy nutrients to flow into the joints through the blood. This keeps movement easy and protects you from arthritis. As mentioned in the point above, drinking water on an empty stomach helps in making your bowel movement softer and makes it easier for it to pass. This keeps your body clean and keeps you away from constipation. Although TB requires special treatments, experts say that drinking 4 glasses of water on an empty stomach can be as effective as medications as this will help in keeping your lungs and respiratory system healthy and functional. Kidney stones are formed when the body doesn’t receive a sufficient amount of water. Drinking water on an empty stomach early in the morning can prevent the formation of kidney stones. The therapy for heart diseases is just as same as the therapy for blood pressure. This is why doctors advise patients to increase their intake of water in order to protect their heart. Drinking water on an empty stomach keeps your body hydrated and keeps the irritated lining of your throat very well coated and moisturized, thus causing no throat infections. Headache is one of the initial signs that your organism lacks sufficient water. Drinking water early in the morning eases the headache intensity and relieves you from your headache. Most pains and aches are linked to dehydration. When your body doesn’t receive sufficient fluids, it affects all the parts of the body and you begin to experience pain. Body ache is just your body’s way of telling you that it needs more water. Drinking enough water in the morning on an empty stomach gives you the required dose of fluid right at the beginning of the day. So, drink enough water to keep your body healthy and your skin glowing! Pure clear water is the most healthiest thing in our world. It can help to improve your health, complexion and body form by drinking sufficient amount during the day. In the review of Acad-Write.com you will see real facts of changes in the health and appearance of people who started to control their water level.